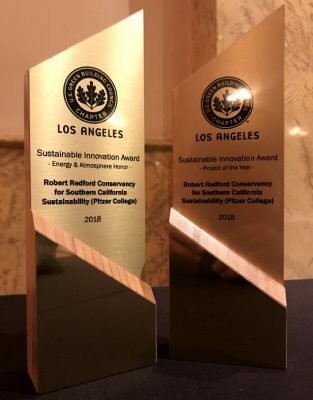 Claremont, Calif. (December 11, 2018) – Pitzer College’s Robert Redford Conservancy for Southern California Sustainability was named Project of the Year by the Los Angeles Chapter of the U.S. Green Building Council (USGBC). The Conservancy also won Honor in the Energy & Atmosphere category in USGBC’s Sustainable Innovation Awards, which recognize sustainable strategies that demonstrate exemplary performance by going above and beyond LEED credit achievement. Under the leadership of Redford Conservancy Director Brinda Sarathy and designed by architectural firm Carrier Johnson + CULTURE, the Robert Redford Conservancy building is a showcase for responsible, collaborative green building and Pitzer’s commitment to sustainable practices. This fall, the Redford Conservancy and Carrier Johnson were also recognized with an American Institute of Architects (AIA) Los Angeles Design Award in the category for sustainability (COTE LA). The Redford Conservancy is home to indoor and outdoor classrooms, offices, laboratories, meeting rooms and an art studio. The renovation also stabilized and adapted the building’s surrounding 12 acres for the Redford Conservancy’s use in promoting its mission of sustainability. Careful consideration was taken in the development of the planning with an emphasis on natural and low-impact design and renovation of the of a nearly 90-year old abandoned Claremont College infirmary. In addition to being recognized for its sustainable design and construction, the Redford Conservancy has earned the U.S. Green Building Council’s LEED Platinum certification and is currently undergoing Net Zero Energy certification. 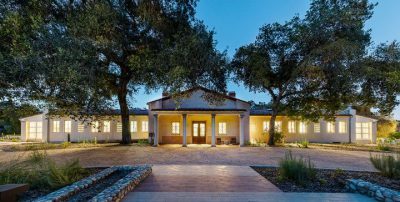 The Redford Conservancy is on track to become the first Net Zero Energy certified building at The Claremont Colleges. This is the third construction project between Carrier Johnson and Pitzer College. Carrier Johnson also designed Phase I and Phase II of Pitzer’s Housing Plan, which includes LEED Platinum certified East, West and Skandera halls and Pitzer, Atherton and Sanborn halls, which earned LEED Gold certification in 2007.